The multi-soothing Aloe Revital Soothing gel with Jeju and chemical-free aloe pulp instantly replenishes your tired skin with moisture for vitality. Contains 93% extract of Jeju organic gel-like flesh inside the leaves contains more amino acid and moisture than its leaves and any other parts of aloe, which helps soothes the skin damaged from UV rays and heat while providing intensive moisture to the skin. 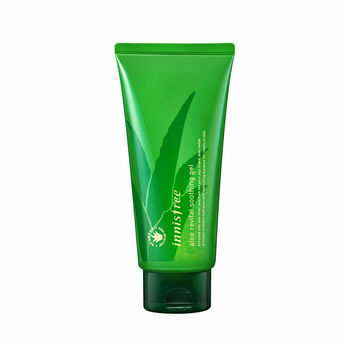 Aloe Vitalizing Energy unique to Innisfree Aloe line soothes the skin and strengthens the skin barrier to make it vibrant and feeling fresh. You can use it on all areas where intensive moisturization is required due to irritation by external environment such as hair, face, arms and legs to revitalize and energize the skin through deep moisturization. Free of colorant, mineral oil, artificial fragrances, animal ingredients and imidazolidinyl urea. Additional information: Innisfree, the first natural brand from Korea, is dedicated to share the clean and pure energy of nature for healthy beauty. It shares the benefits of nature from the pristine island of Jeju, allowing for vibrant beauty and pursues an eco-friendly green life to preserve the balance of nature. Widely popular worldwide, this brand is creating spaces where nature and skin can rest in the green energy of pure Jeju. Try Aloe Revital Soothing gel for a beautiful skin!